LONG BEACH — Most boaters are familiar with the Gerald Desmond Bridge — the long, white arched bridge that carries four lanes of Ocean Boulevard from I-710 west across the Cerritos Channel to Terminal Island — and the $1 billion project that is underway to replace it with a more modern structure. In the shadow of this 410-foot project, another bridge replacement is also underway. The Commodore Schuyler F. Heim Bridge, named after the commanding officer of Terminal Island Navy Base during World War II, is one of the largest vertical-rise bridges on the West Coast. It has been around longer than either the Gerald Desmond Bridge or the Vincent Thomas Bridge, having been dedicated in January 1948. 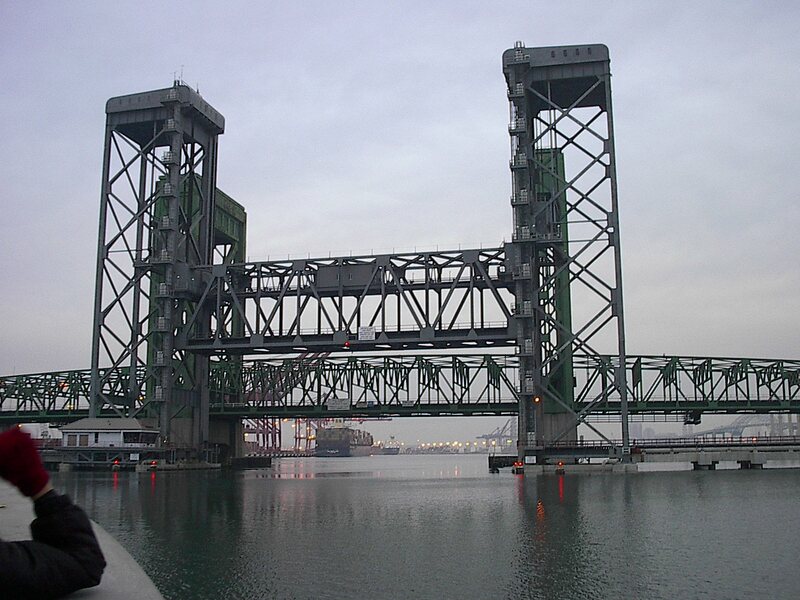 Over the past six decades, the smaller bridge has played a crucial role to the transportation networks that link the nation’s busiest harbor complex to the rest of the nation — as vital as either of its better-known counterparts. Found in the heart of the harbor, the three-quarter-mile stretch of SR-47 that the Heim Bridge fills is the only north-south link for commuter and truck traffic between Terminal Island and the rest of California. Ultimately, the Heim Bridge, which was notably featured in the 2010 movie “Inception,” will be demolished. In 2011, Caltrans broke ground on a $210 million project to retire the old giant and build a new one that meets current seismic standards. Safety features include widening the bridge’s three lanes in each direction to 12 feet and adding shoulders up to 10 feet wide on both sides. A 12-foot-wide auxiliary lane on the southbound side will also be added, in the hope of easing traffic congestion and allowing for construction of a proposed four-lane expressway connection, although the Alameda Corridor Transportation Authority project is currently facing legal challenges and has yet to be funded. Work on the bridge, which will be done in six stages, is expected to be completed in 2017.